Trunk or treat! Come get in on the candy and fellowship action early! We’ll have dinner outside and then trick or treating at the vehicles in the parking lot. If you feel so inspired, decorate your trunk for the holiday or simply come with some candy to hand out. We encourage folks to bring chairs and/or blankets to sit on outside. Regardless, it will be a great time of fellowship, fun, and fall festive. 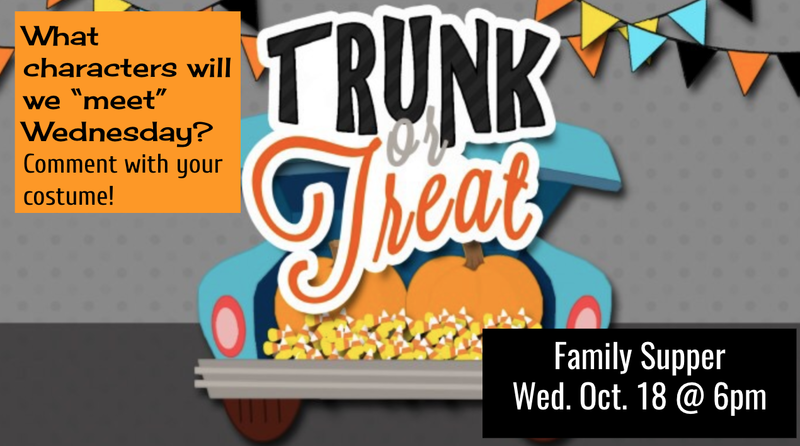 If you do decide to decorate, note that prizes will be awarded for the best costumes for adults and children as well as for the best trunk.